German states with Opel plants will set up a task force to discuss possible aid for the General Motors Co. unit after the Berlin government rejected GM's request for 1.1 billion euros ($1.3 billion) in loan guarantees to help finance a major restructuring of the money-losing division. The German states of Hesse, where Opel is based, Rhineland- Palatinate, North Rhine-Westphalia and Thuringia said they are ready to discuss financial aid for a plan to cut Opel's capacity and workforce by a fifth and invest in new products. Germany's refusal to release aid to GM from a state rescue fund aimed at helping companies hit by the economic recession threw into question how the Detroit automaker will fund the 3.6 billion-euro reorganization. Analysts said Opel and its UK sister brand Vauxhall may have to eliminate more jobs to boost savings. German Chancellor Angela Merkel said GM will have to go to the regional governments for money to reorganize Opel as she reiterated that Germany won't provide federal aid. “It has become clear today that the states are able” to give loan guarantees to Opel, Merkel told reporters in Berlin on Thursday after meeting with the four state premiers. Opel may also tap federal research funds for projects, she said. Rhineland-Palatinate, where Opel employs 3,200 workers at a component and engine plant in Kaiserslautern, may be able to top up the amount of guarantees to about 100 million euros, Beck said. The figure compares with 62 million euros set out in a May 12 PricewaterhouseCoopers report. The premier of North Rhine-Westphalia, Juergen Ruettgers, said there were options to help Opel, but he declined to name details. Thuringia's premier, Christine Lieberknecht, said the states will work closely together to try to ensure that none of Opel's four German factories in Ruesselsheim, Bochum, Kaiserslautern and Eisenach are axed by GM in any further cost cutting. Thuringia, where Opel's smallest German factory with about 1,600 staff is located, already pledged 27.2 million euros in loan guarantees. Roland Koch, premier of Hesse, home to Opel's Russelsheim headquarters, said there will be no bidding war among the states to protect jobs in their regions at the expense of other states. Opel CEO Nick Reilly told reporters Wednesday that the automaker has no plans to significantly alter its reorganization plan after Berlin's rejection of federal aid. Opel will probably seek about 800 million euros from the European Investment Bank (EIB), the business magazine WirtschaftsWoche reported, although a spokeswoman for the German Economy Ministry said Berlin would not approve guarantees for (EIB) loans. The EIB is the lending arm of the European Union. In February, Saab Automobile, the GM unit that was taken over by Spyker Cars NV, won a 400 million-euro technology-development loan from the Luxembourg-based lender. Klaus Franz, Opel's top labor leader, said yesterday the four states may also help open the way for international capital-market financing. At least two of Opel's four German factories may be closed without German aid, he said on June 2. Under GM's original plan, the carmaker was seeking 1.92 billion euros in loan guarantees from European countries to fund a restructuring that includes closing a factory in Antwerp, Belgium, and eliminating 8,300 of Opel's 48,000 jobs. 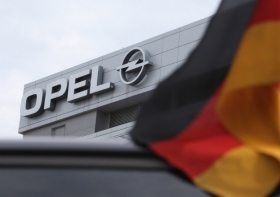 Along with the German aid, Opel is asking for 333 million euros from the U.K., 437 million euros from Austria and Spain combined and 50 million euros from Poland. Opel said in a February business plan that 4,000 of the 8,300 planned job cuts would be in Germany. The division seeks to break even in 2011 and return to profit by 2012.